I recently discovered your site and some messages about my old school Fawcett. I have just been down there and taken some pictures of it and around the area. I was born in Brighton so it is very dear to me, I am moving to America later this year and wanted to take a bit of here with me. Your site is perfect for that, as I’m sure it will continue to grow with contributions from many. I am an old Fawcett school boy and looking at these photos the other night I could almost hear the rumble the kids used to make. I am not going to go into a horde of teachers names because it would take all night, but I can remember getting the slipper across the backside for going out of school during the break. The only bit of a puzzle I am getting is over the Pelham infants school as I remember this as being Pelham street secondary school for girls. The Margaret Hardy entrance was to the left – I walked it hundreds of times, 1959 -1964. Miss West the headmistress used to look out of her office window, just to the left of the gates, for any late comers in the mornings, and it was always me! I went to the school from 1936-1939. It was then known as the Brighton Intermediate School. 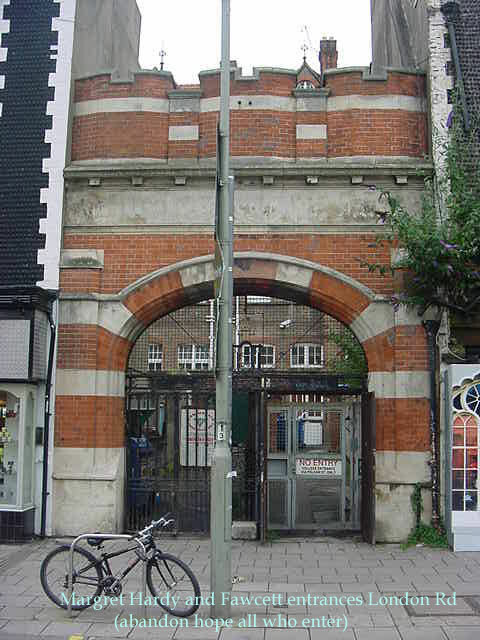 Boys entrance was in Pelham Street, Girls entrance in York Place. We had four “Houses”, Fawcett, Godwin Russel and Tettersall. We had some pretty tough teachers, and the Prefects were minor tyrants. Nevertheless a good school. I played in goal for the school football team in the final of the Junior Barlow Cup at the Goldstone. I think the gate at the match was about 27! All relatives of the players. Many thanks to Ian Brook for these nostalgic pictures. I attended Brighton Intermediate Girls 1940-1945. The schools then changed names beginning a new phase following the end of the war. I have been away from Brighton for more than 50 years but it was great to see the once familiar building again particularly the entrance in London Road. The girls entrance was the left hand side. We used St Peter’s Hall for PT (physical training). I attended Fawcett from 1951-1955 and the photos from Ian Brook certainly brought back lots of memories.I remember that most of the teachers had their own implement for inflicting pain whether it was a leather strap or slipper or cane and it certainly used to keep us quite for a while after a dose.Can any body remember the bread shop in Trafalger St. We used to skip over the wall at break time for a hot roll,and if we got caught it was punishment time.I was in England in June this year (I now live in Australia) and would have liked to have paid a visit to the old school but time was too short.This really is a good site and hope many more old boys find it. Hi Ian, Just a note to say I liked the photos which brought back memories until we got moved to Patcham Fawcett. Are you the same Ian Brook that attended Fawcett in early 60s? If so I beleive we know each other. The bakers in Trafalgar Street was called Dudderidges (I think that is how it was spelt). I went to Margaret Hardy and left in 1965 – and they were still going strong! The bakers I believe used to make Beano Pies. We used to get them as we came out of the Brighton Boys’ Club. Carol – do you remember going to school with Betty Lucas? I went to Fawcett between 1954 and 57 when we transferred to Westlain. Re Dudderidges: we used to go out at break time and get the best hot crispy rolls ever. The beano shop was up the top of St James’s Street, simple fayre but delicious. Sure I remember John Wignall (Wiggy). Hi Alan, we were in the same class through Fawcett and Westlain. I’ve looked at the Westlain site but not many early names and none I recognise. Yes the beano pies came from ‘The Pie Shop’ in St James’ Street. Do you remember the name of the sweet shop in the next street up from Pelham Street where we all went? 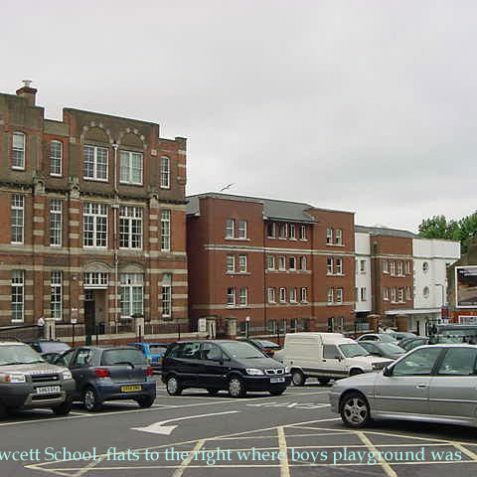 I was at Fawcett School between 1948-50. I remember all the houses mentioned. Also teachers – Benson, Bond (who did have a metal plate in his head from a war wound). I remember him throwing a chair at someone. I played chess for the school. Does anyone out there remember Michael Cohen (great friend), Tony Wilkes or Ray Gunstone? Ref teachers for Fawcett School, here are a few more names: Burt White, Daddy Dyer, Jazz Bolton, Mr Ward, Mr Lowe, Billy Benson, Mr Griffiths, Mr Lane(he was the bee keeper), and Mr Davis. (music). Regarding Patcham Fawcett teachers; Bert White, Roy (Daddy) Dyer, dear old Jazz, Charlie Griffiths, I remember them. Also, Grace Brandwood, Bill (Flycatcher) Shields, Harry Bradford, Maurice Packham, Pete Holland, Colin Ashdown, Des Moore, Charlie Cook, Caroline Conniff to name some more. Two to hate; Denyer who took Science and Jack Widdup who took PE and Games. 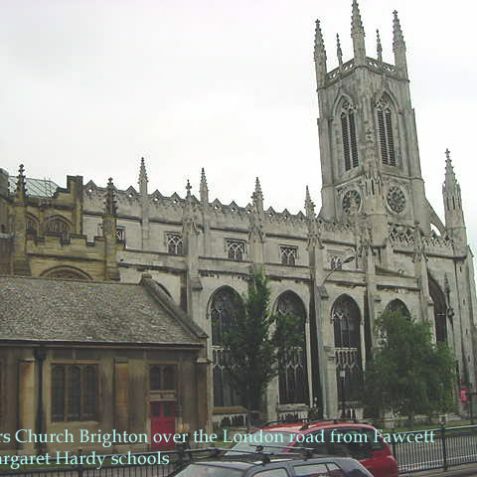 I was at Patcham Fawcett from 1969 to 1973. I remember Dave Maynard, he and I used to muck about in Ma Holkham’s typing lessons. My late brother Trevor was also at Fawcett form 1973 to 1978 along with our great friend Gerry Clay. 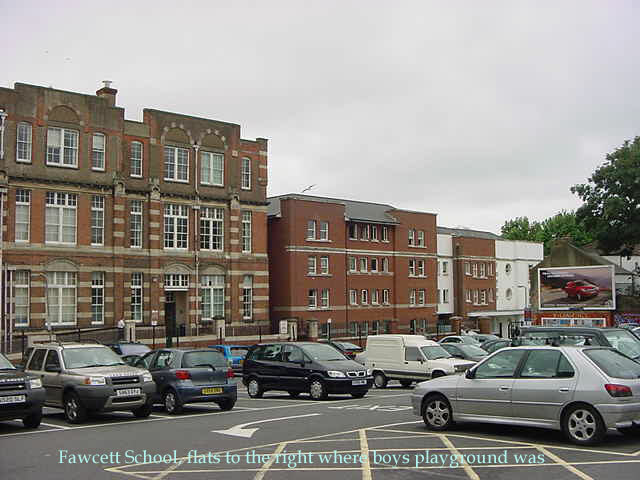 I was at Fawcett last year in Pelham Road, first year Patcham Fawcett. Have to say when I look at the main enterance it reminds me of Slade prison. What a contrast to the new school. I remember the school meals were great, everything clean and great facillities. Shame the teachers were not up to the same standard. 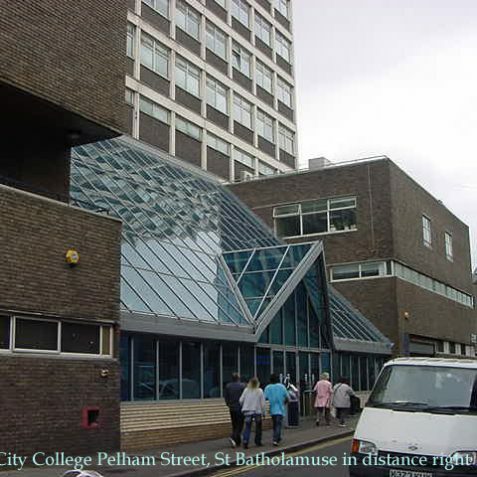 Hi Peter Blasby, I was at Fawcett from 1963; in the last year we all moved to the, then new, Patchem Fawcett. I’m afraid my memory isn’t good but your name definitely rings a bell, we of course mostly only knew each others first names didn’t we. I was in the ‘B’ stream all the way through and lumbered with Des Moore even for the last year at the new school. Ian (nickname Sena). I went to MargaretHardySchool from 1940. I had to keep changing schools because of the air raid bombing. When I was younger I went to St Bartholomew’s and played in the street because we didn’t have a playground. I think one of our teachers at St Bartholomew’s was Miss Roust. My brother Phil would get canned on the hands by a teacher whose name I can’t remember. I was always getting disorder cards for talking. Is the Rita Denman mentioned above the one I lived next door to in Queens Park Road? What a change from 1950-5 when I walked this street to and from school. Where is the row of terraced houses complete with basements? The basements were just grilles in the pavement so the rooms must have been very dark. I can still remember standing on that side of the street in September 1949. nervously waiting to start my first day at the ‘big school’. Happy memories, a good school, and a brilliant web site. 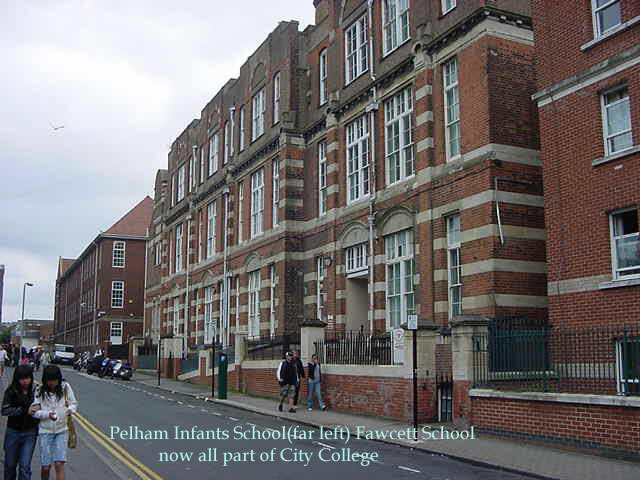 I went to Fawcett from Sept 1961 to July 1963 after which I transferred to Varndean after taking the 13+. Some other teachers I remember well are Tolhurst (French and Form mater of 1A), Mr Servelle (Form Master 2A and French) – he took us a lot further in one year than Varndean, Des Moore (English Lit and Navy Club – for those permitted into it; I wasn’t), Jazz Bolton (Geography with violence), Mr Griffiths (Chess Club), Stan Silverman (Physics with an edge), and the headmaster Mr Pollit. My cousin, Ian Davey, was in the year behind me and also migrated to the then new Patcham Fawcett. 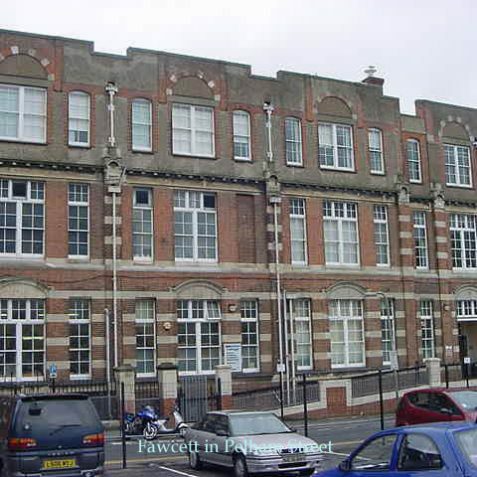 Recently on a visit to Brighton I was able to visit the old Fawcett School building, being accompanied by one of the secretaries, I was able to point out the former classrooms and several other items of interest. The memories came flooding back even after leaving the school in 1956. Apart from the various modernisation the corridors and classrooms are still all in situ, my old class from when I was a twelve year old is now an office. I will update these notes at a later date when I have had a further visit. 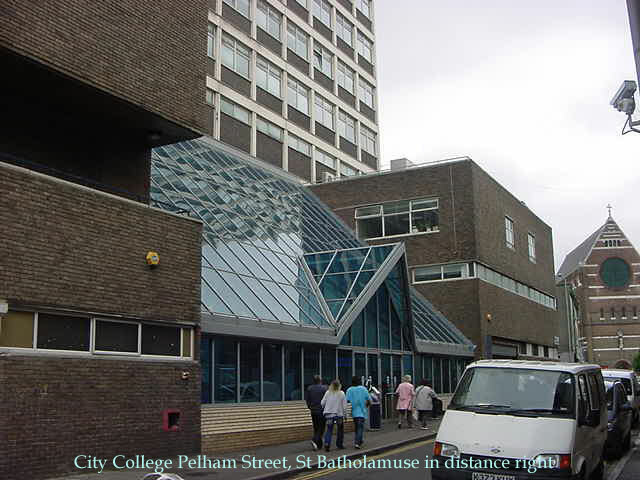 Pelham Street Infants was the ground floor of the red brick building, along the Eastern side of the street from the northern junction with Ann Street. I was a pupil from 1952 until I attended Balfour Road. I remember the names Mrs Lewis and Ms? Gabbertash. Miss Coo was the headmistress, who went on to Whitehawk I believe. I went to Fawcett from 1958 to 1963. Teachers I remember well are Jazz Bolton, Des Moore, Stan Silverman and Mr Harris (woodwork). I felt the anger of all of them at some stage. I was in Form 1B then went on to form 5A and eventually took and passed GCEs (almost unheard of at this school at that time). I went on to join BISON club and played football with them. Biggest disappointment was not becoming a prefect at first and not being able to play football with my mates in the prefects small yard at the rear. Biggest fear was as a ‘perk’ being jammed onto the concrete steps down at the rear and being jumped/spat on. Happy days? I went to the old Fawcett in Pelham Street for the first year. 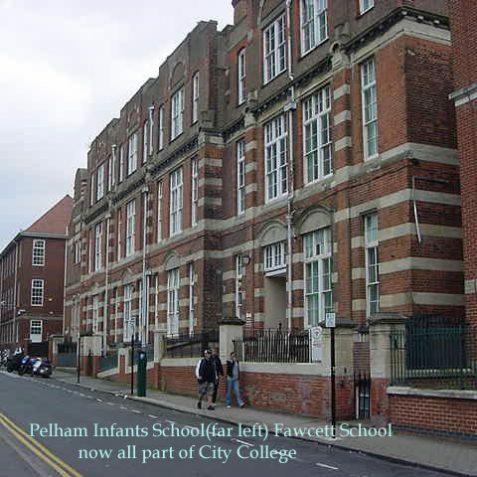 In 1965 the new school opened: Patcham Fawcett. Brand new school with a brand new swimming pool. Doesn’t anyone remember those days? Please get in touch. 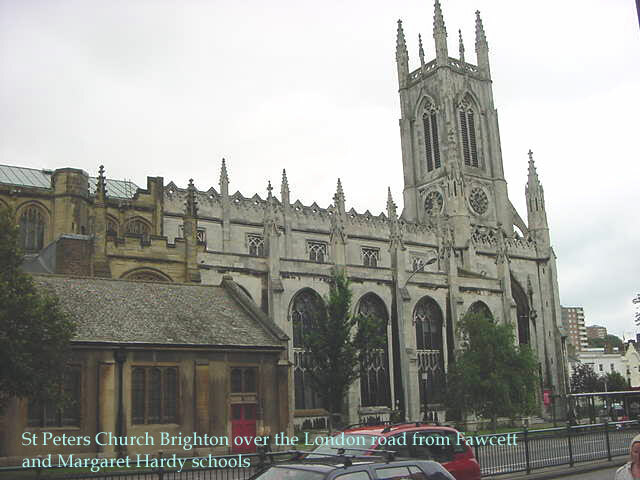 I attended Fawcett School from 1952 until 1957. Got away with murder regarding lessons. I was lucky to be blessed with an aptitude for athletics and all forms of sport so I used to be in charge of the sports equipment and I could wander around with a football laser and a tin of dubbin never challenged as to what I was doing. Does anyone know the wherabouts of the following school mates: Bert, Perry, Mick Washington and anyone who can remember me? I think you used to be called Erevic? Not Eric? Our form master was Maurice Brown whom I remember as the best teacher I ever had. Johns the PE teacher had a vicious temper and I remember him “walking into” – as he used to call it – a Jewish boy named Frost. It was dreadful to watch. I fear I never got on with the young Palmer. He once said, in front of the class, “I detest you most of all the boys in the school.” That was me. Perhaps it was because, after one music lesson he asked “Who wrote the Moonlight Sonata” ? I quickly responded “Who wrote the Surprise Symphony?” We all knew because we had just heard it. He didn’t know. Afterwards, to save his face he asked me what number it was. I should have said any number that came into my head. But I didn’t. Unlike you, I was in the Chuckouts at football. We put down bundles of clothes for goal posts and the game bore no resemblance to football. Anyway, we were always late, wandering up Beaconsfield Road. Do you remember the Operettas? I took the lead in “Highwayman Love” and forgot my words on my first entry. All the very best Eric. Maurice. Anybody that knows me. 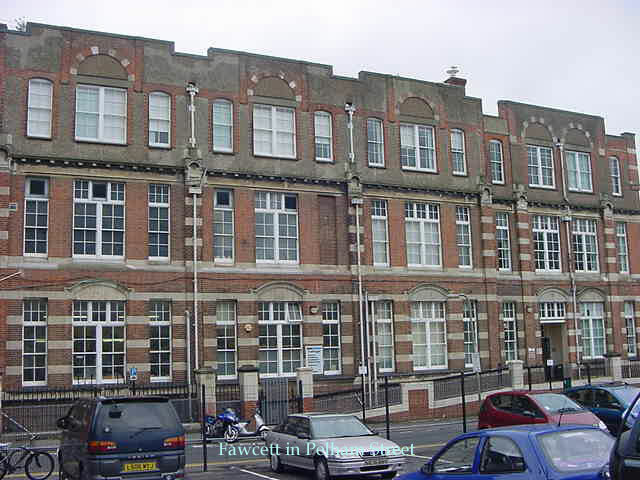 I went to Patcham Fawcet from 1963 – the old and the new school – and was in B stream. I now live in Farnborough but am moving to Worthing in the next couple of weeks. You can contact me on ronjan@talktalk.net, I would love to hear from you. I went to Fawcett Boys from 1958 to 1963. (Nicknames = Kellogs, Bloggsie, the “Why” man). Teachers I remember: Bolton, Moore, Silverman (thanks, sir, you gave me confidence for physics), Harris (my mum’s still got the stuff we made in your woodwork class), Benson (RE = time to de-stress)’ and Pete Holland (thanks for the outward bound camping climbing club you set up). Funniest day was when the whole of 4B got Keith Warbuton to sit on top of 3 desks stacked on top of the other before Jazz Bolton came into the class. Bolton went maniac. It was a riot! Class mates I remember: Dave Richards, the amazing artist; Colin (dad had a pub nearby) John Morris; Roger Chapman - great soccer player (dad a fruit & veggie shop at the lane of Trafalgar street). I remember Margaret Hardy school next door before they built a wall between us and the boys day finished before the girls (they tried lots to keep us apart). We used to wait outside for the girls at the main entrance in London Road. There was a smart ladies shop there with big display windows. One afternoon sparring around with one of the boys I went though the plate glass windows. What a smash!! The whole lot caved in! The boys said “run!”. So did …across to the blue police box opposite next to St Peters Church and confessed it was me to the police man there. Got a write up in the Evening Argus!! And no reprisals. Happy days. 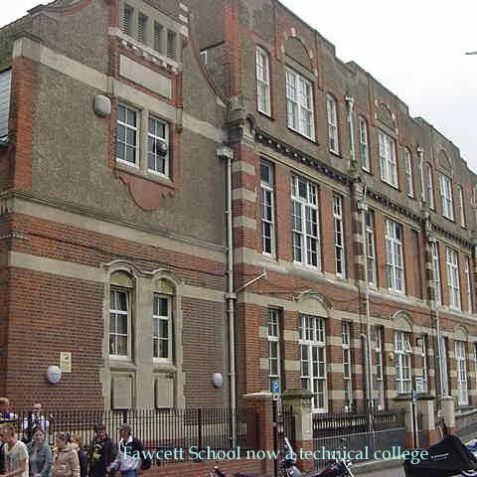 Does any body know which ‘Fawcett’ the school was named for? Was it Colonel Percival Harrison Fawcett (18 August 1867 – in or after 1925) a British archaeologist and an explorer? Hi, I just wondered if anyone remembers my dad David Vaughan who used to attend this school? I went to Fawcett School, was in 4a and left in 1959. My best friend at school was Jimmy Hilton. The teachers I remember are Jazz Bolton, Taffy Evans, and Bill Benson. Benson used to hit us on the knuckles with his ruler. I remember Ron Hart, he was learning to play the violin at the same time I taught myself to play piano. I started off in Class 3b and then onto 4T1 for my final year. 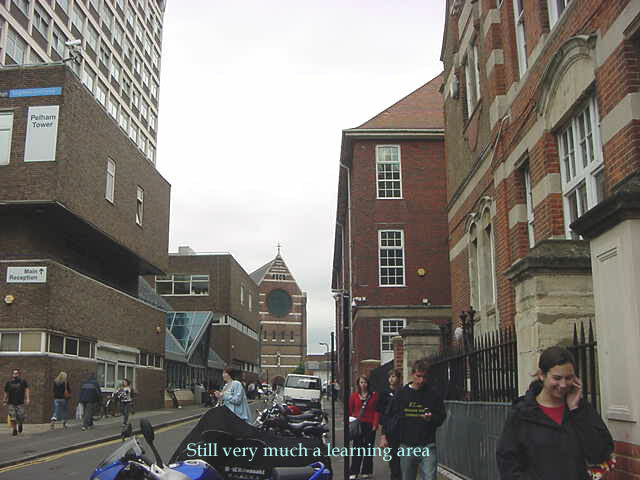 I then went on to Preston Technical Institute followed by Brighton Technical College. Ron may remember me as he called for me at my dad’s pub, the ‘White Hart’ York Hill. Mr Lane put me in charge of his Science lab. I remember one break time I was setting up the lab for the next class when a couple of the lads were cheeking me. I connected Mr Lane’s bunsen burner to a water tap and sprayed the culprits, then re-connected the bunsen to the gas tap. Later that day I returned to the lab and saw a large wet patch on the ceiling. I asked Mr Lane what happened, he told me that some prankster had filled his bunsen with water. I looked suitably shocked! I was at the school during the War years and remember the roof being destroyed by fire bombs. I believe that is why the school bison insignia has flames depicted on it to mark the event of the firebombing. Yes it was definitely on the left, I was also there between 1960-1964. The last class I was in was Mrs Higgins’, I left in the summer after doing the Brighton Schools Exams. I remember Miss West very well, she looked like she was Asian & very small, but very intimidating. We put washing powder in her afternoon sugar bowl for her tea. She said she was surprised at me doing that as I was usually well behaved. We got the job of her tea as when you were in Housecraft, in the other building across the playground it was your job. One thing that always annoyed me was the boys went home at 4pm but the girls had to wait until 4.15 pm. It didn’t matter though as they waited for us anyway. I had a very good education from there, as when I went to another school in Richmond for a term, I came top of the class & I had only been in the B stream. 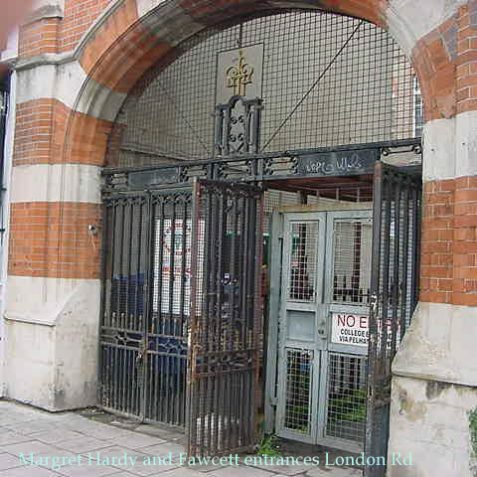 I went to Maragaret Hardy school between september 1961 and 1965 they were happy years for me full of good memories. I went to Margaret Hardy from about ’59 to ’63. I HATED French and the teacher, “Madam le Sec”, disliked me as much as I did her! I loved music with Miss Savage though. In the later years we kept going to and fro the annex in Pelham Street. Girls names I can remember are: Carrol Lockheart, “Jess” and “Toni” and Margaret Gorringe, whose brother I have now been married to for over 42 years! I used to love The Beatles and my Mum took me in ’63 and the price of the ticket was £4!! A LOT of money then! I was at Intermediate Girls from 1940-1945. Headmistress Miss Scott. Gwen Manville – music, Miss Webb – maths, Miss Garrow – history, and so on. I remember P.T. in St Peter’s Hall with Miss Walsh and walking crocodile style along London Road, hockey sticks in hand, to the playing fields at Preston Park where on occasion fighter planes would be machine gunning overhead. So many memories. I’ve lived in N.Z. for over 50 years. It would be lovely to hear from ex-pupils of that era. I left Intermediate School in 1945. Are lists of the pupils available still? My class was 4T1. My friend Gordon Read who was in 4C is still going strong and lives in Canada. I was at BIS from about 42/46 after being bombed out and coming back from being evacuated to Burton Leonard in Yorkshire. I have lived in New Zealand for about the last 50 years, and would love to hear from anybody who remembers me. Was interested in Margaret Le Mar’s comments. I was at Margaret Hardy from 1945 (Betty South) I remember all those same teachers and the treks to Preston Park to play hockey. St. Bartholomew himself would likely turn in his grave if he were to read the caption of the above photograph! Des Moore and Daddy Dywer in my opinion were good teachers. There was an art master called Bill Polley and a chap called Vernerdi. A chap called mason (metalwork) and kendlewick (politics), the most boring sonorous tones ever to emanate from a person’s mouth – totally disenchanted with his job. I was there 58/ 60 – anyone remember Peter Stunt and Bert Collins? I attended Fawcett between 1956 and 1961 with a break in 1958 when I went to Canada. I was in the A stream as far as I remember. Memories – cutting up bulls’ eyes in Biology held in the small building in the Junior playground, and also taking violin lessons there – chatting to the girls in Margaret Hardy’s over the brick wall – taking typing lessons in the girls school (good wheeze) – getting the strap from Bill Benson – walking in pairs to the playing fields in Preston Park – going to Woolies in the lunch break – buying Domino cigarettes in the tuck shop in singles – as a prefect and being allowed to leave the school at break times we used to buy penny rolls in Trafalgar Street and charge for them – had a white prefect badge first year and blue one second and was allowed to sit in a chair at the side of the hall in Assembly – made other kids pick up paper as a punishment for doing something wrong I think! I could go on and on! I think this certainly was another world and school days are much different now – but it served me well as I was taught many good attitudes for living I believe. 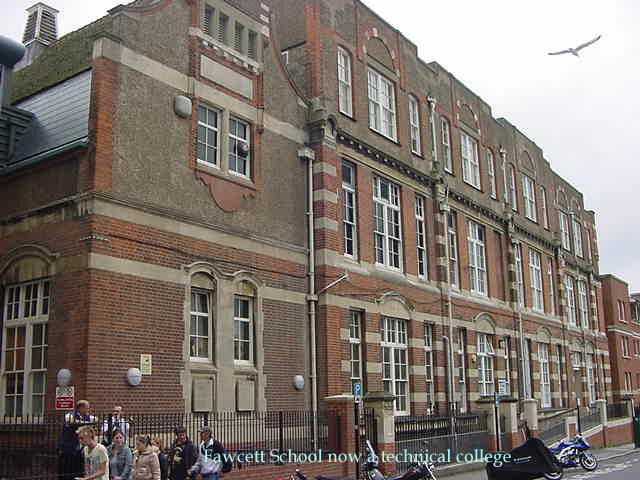 I attended Fawcett, leaving in 1959. I remember Mr Bond and Mr Davis music. Bond was from memory a good music teacher who also taught me English. Davis had to my mind little knowledge of real music. I was never interested in sport but played my violin during sport activities if I could. I was born at Hollingbury Rise in 1931 and went to Brighton Intermediate during the war early 40’s. My vague memories there are The French Teacher Ms Lyons and the Class Master Mr Blackman, most of the teachers had been brought back from retirement. I remember the incendiary bomb in the roof and the machine gunning of the school playground and often wonder if the bullet holes are still visible. My mother Gladys ran a Dancing School at St Mathias Church Hall and 3 times a year they put on shows with the girls for food parcels for Prisoners of War in Germany. My Father Rusty and his father Steve Rusbridge where both retired Inspectors from The Brighton Borough Police Force. I myself am now retired after 50 years in South Aftica to South West France. I went to Margaret Hardy from 1960 – 1965. My sister Pauline was there from 1963-1967. I remember Madame Le Sec, Miss Savage, Miss West the Headmistress, Miss Matthews – an excellent English teacher and Miss Roberts, who took over from Madame Le Sec in about 1961. The memories are flooding back now! 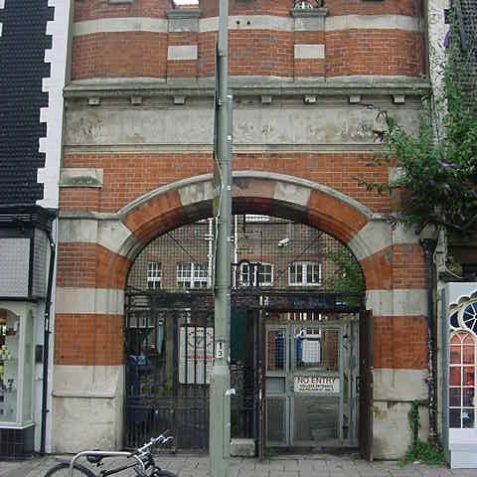 I have always been fascinated by the rather grand archway in York Place leading into the school. I’ve often wondered if it was there before the shops and if it stood alone. Does anyone know the history of this and when it was built? 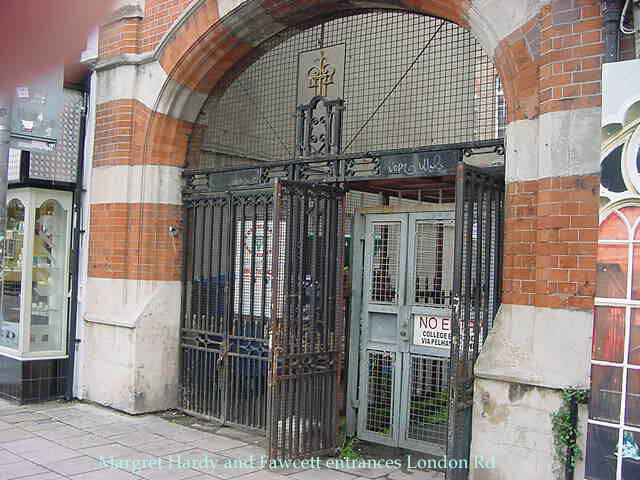 I went to Margaret Hardy School 1960/1965 (approx). I have been trying to find class photos of that time. Did we have them? Sadly all mine were lost. I was in the B stream until I went into the shorthand/typing class. My best friend was Susan Smith and after all these years still is. Can anyone help with the photos ? Such memories those pictures of Fawcett conjure up in my mind. I went to Fawcett between 1961 and 1963. I took the 13 Plus and went on to Varndean. 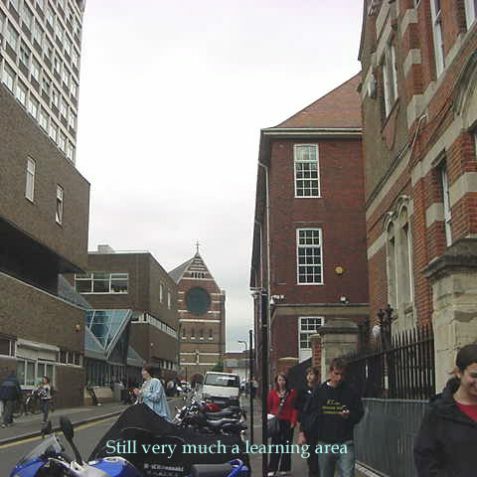 What I discovered during my first few weeks at Varndean was that Fawcett had some awesome teachers and except for not ever having taken a class in Latin, there was no subject in which I was behind at Varndean. In fact in Geography (Jazz Bolton), History, French (Mon. Servile and Mr. Tolhurst), Maths (Mr Shields), English (Sam Webb), English Lit (Des Moore), and Physics (dear old Mr. Silverman) to name a few, I’d say I was at least a term or two ahead of my peers at Varndean. I learned a great deal from my classmates and the teachers at Fawcett and enjoyed my time at the School. Geoff Coupland was in my class – he and I have remained close friends. I emigrated to the US in 1979, going to work for Uncle Sam in Washington DC. My wife and I now live in the Phoenix area (Arizona). Facinating finding this page quite by chance and the note in 2014 from John Upfold and his reference to playing the violin. If it is the same person he and I were in the St John’s choir for a few years. I joined the school in 1953 but by 1955 had moved to Dorothy Stringer (along with Mr Carter who was to be the new headmaster) so lost touch with most of my class mates. My name is Roy Wallace. I attended Brighton Intermediate School 1945-49. I boxed at the Dome. Was in the Football XI (as a reserve) but played a few games. My pal Eddy Ball was our goalkeeper. I believe our captain was Furnel? Also anther in the team – ‘Wisden’. Is anybody out there? I went the intermediate school as it was before becoming the Fawcett. This was from 1945 onwards and I remember Bill Holness who lived at Moulescombe we were great mates then. My Dad Ron Spathaky (1914-2013) taught English and French at the Intermediate School for about three years until he was called up in 1941. Does anyone remember him? Eric Feast, you might just have been taught by him. I had a look round here. Fantastic inside, lots still original. Yes I remember Betty Lucas. She was one of my friends who had a lovely boyfriend who ran so fast behind our school bus to meet her at Withdean. He was also a fab dancer too in the Barn West Street. Friends were Michelle leslie who emigrated to Canada, Cheryl Hardwick, fab mate Colette Bird, my dear friend who lived on Brighton seafront above the rock shop, Tina Washington, Rita Regan and Mary Partington who I used to hide in the toilets as she was scared of a couple of bullies bless her. Days to remember were when we all were late back from lunch because we went to Bellmans record shop to see The Love Affair who were in Brighton. Many got the ruler across their legs from Miss West the headmistress. Hated the teacher Mr Harvey but loved dear old Elli B, Mrs Ellis- Barker a diamond. I was at that school from about 1964-1968 and couldn’t wait to leave.